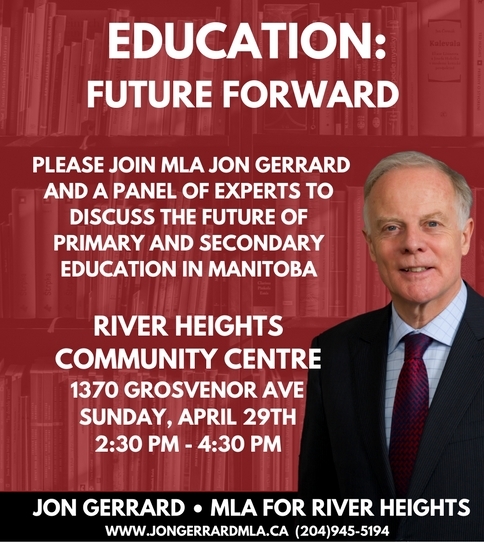 April 19, I had an opportunity to speak on Education week in a reponse to a Minsterial Statement. My comments, from Hansard, are below. They can also be seen on video at this link. Mr. Gerrard: Madam Speaker, it is Education Week. I thank Manitoba teachers and other staff for their hard work, their dedication and their commitment to providing students with the best possible education, and parents for supporting this effort. Manitoba Liberals believe that our children's education at all levels, primary, secondary and post‑secondary is the key to our future. Yet, halfway through their four-year mandate, this government has done little to improve Manitoba's education system. The Pallister government has shown no leadership on indigenous education issues when graduation rates for indigenous students are at an alarmingly low rate of 48 per cent. Instead of working collaboratively with Manitoba teachers to build a stronger education system, the PCs have blindsided them with a zero per cent pay increase and reductions in support. This government cuts to francophone services and education have put 50 years of progress in French language education in Manitoba at risk, even as the number of children in French education is rising.